The Canis lupus chanco was identified as a subspecies of the gray wolf in 1863 by British zoologist John Edward Gray. It is also known as the Canis lupus chance, Canis lupsu laniger, the Tibetan wolf, Mongolian wolf, and Chinese wolf. 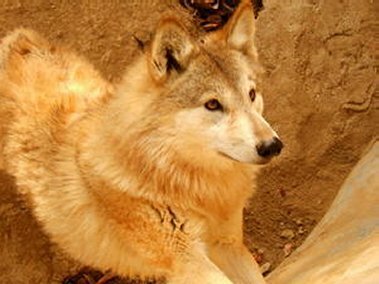 For a long time, the Tibetan wolf and the Himalayan wolf were recognized as one and the same. However, recent genetic studies suggest the Himalayan wolf to be a distinct species, the Canis himalayensis. The Tibetan wolf can be found in central China, the Manschurai, the jungles and deserts of Mongolia, North Sikkim, Tibet, south-western Russia, the Himalayan regions of India, Nepal and Bhutan. The size of the Tibetan wolves can vary from 58 to 65 inches (from nose to end of tail) and from 27 to 30 inches high, weighing from 65 to 70 pounds. Compared to the common European wolf, they are slightly larger, with shorter legs. Their skull is similar with a longer thinner muzzle. This "wooly wolf" has a long shaggy coat which seasonally varies in color, usually a blend of white, yellow, brown, grey, and black. The Tibetan wolf is an amazing hunter with excellent survival skills. It is known to hunt both during the day and at night either alone or in packs. Its preferred prey includes deer, blue sheep, and other large mammals. When food becomes scarce, it will feed on smaller animals like marmots, hares, ground squirrel, and mice. When hunting, the wolf can reach speeds up to 40 mph. The Tibetan wolf reaches sexual maturity in it's second year. Breeding season usually occurs in the Spring. To maintain strength of the pack, only the dominant male and female breed. Two months later, four to six pups are born weighing roughly one pound each. At three to four weeks they will leave the den. They are nurtured by their mother for two to three months after which they begin to tag along with their parents hunting.. In the wild, they live anywhere from six to ten years. They can long as twenty years in captivity.